I do a lot of work with geospatial data at my day job. Occasionally, I’ll find a cool data set and I’ll save it off so I can spend some time looking at it and seeing if I can find anything particularly interesting. 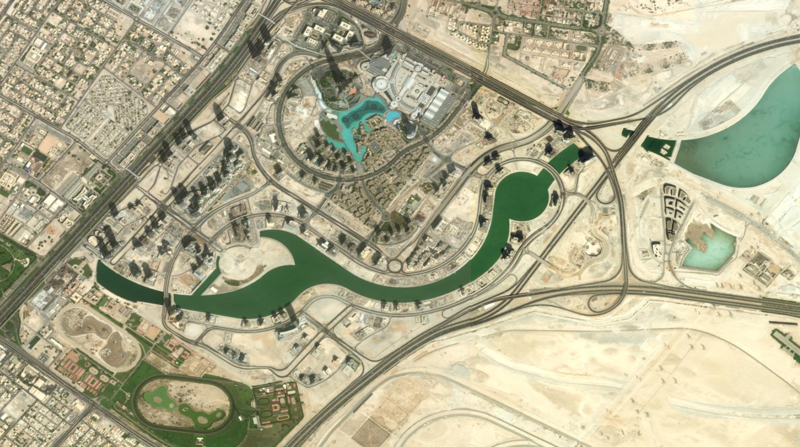 I found an ArcGIS server hosted by the United Arab Emirates that hosts some very nice imagery of the country. 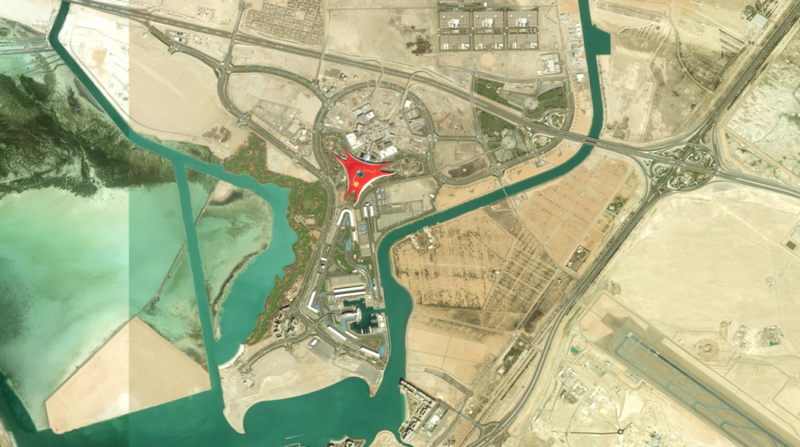 The imagery is part of the Abu Dhabi Geospatial Portal. 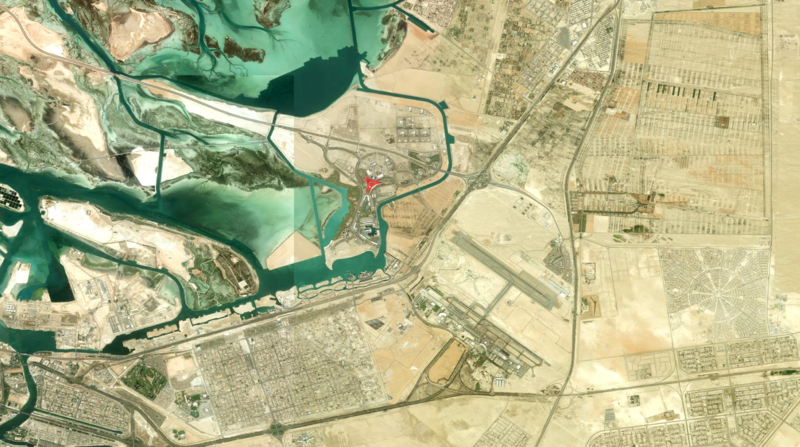 Despite the name, the project actually has imagery from all over the UAE, including Dubai. 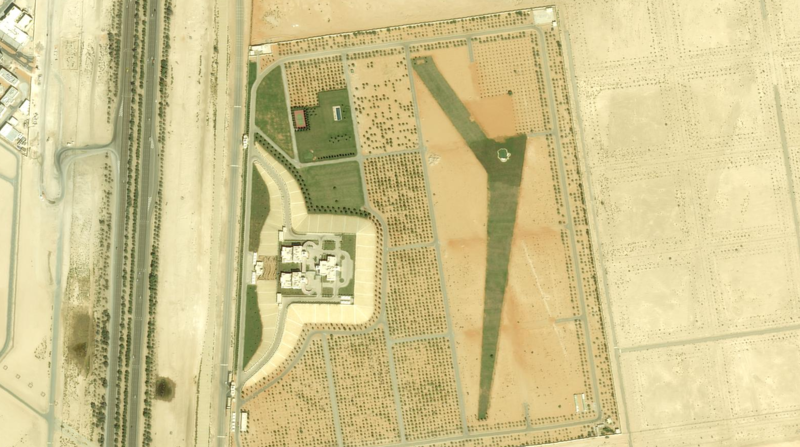 According to the metadata, this imagery comes from WorldView-2. You can click any of the images to get the full size version. Here’s a wide shot of the city of Abu Dhabi. In case you’re wondering, Abu Dhabi is not the same place as Dubai. 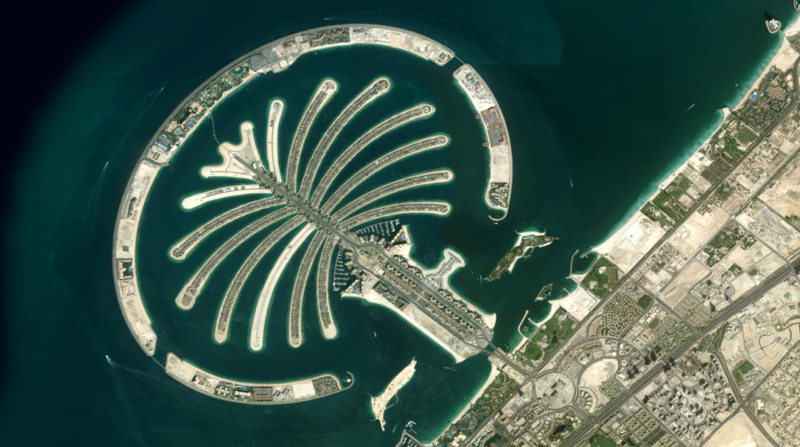 It’s southwest of Dubai and is the country’s second biggest city and capital. This is a beautiful shot of the city meeting the Persian Gulf. But wait… what’s that red triangle in the middle? Is that a Ferarri logo? 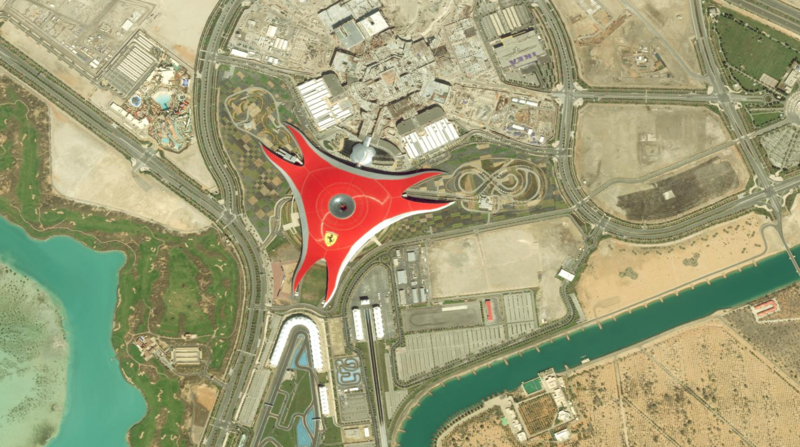 This is Ferrari World Abu Dhabi. 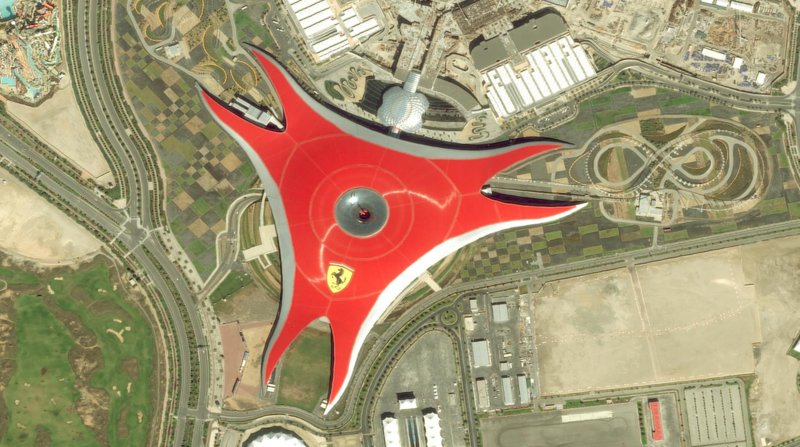 The world’s largest indoor theme park and currently the only Ferrari theme park. 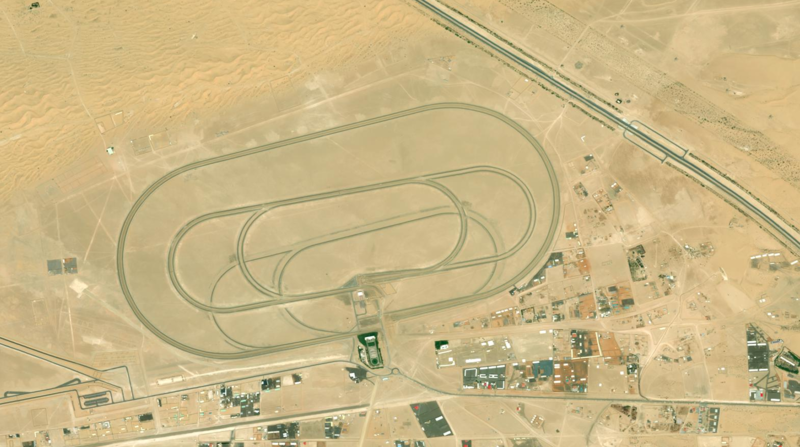 There appears to be a racetrack nearby for visitors to test drive a high-end sports car. 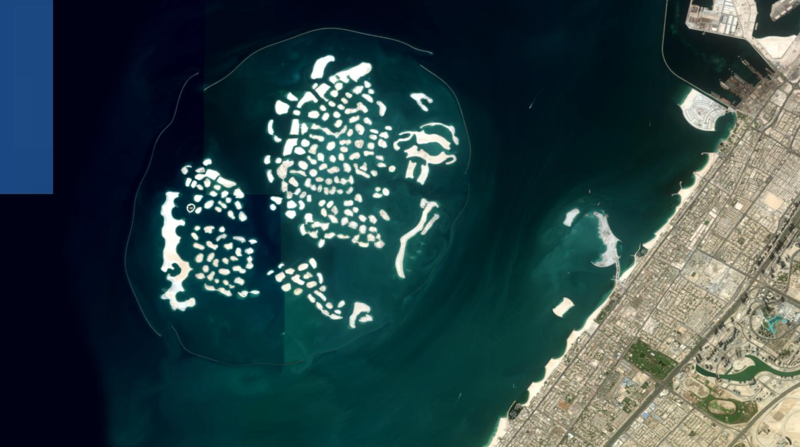 Moving to Dubai in the northeast, we can see the famous man-made island archipelago, The World. It doesn’t seem to be doing very well. 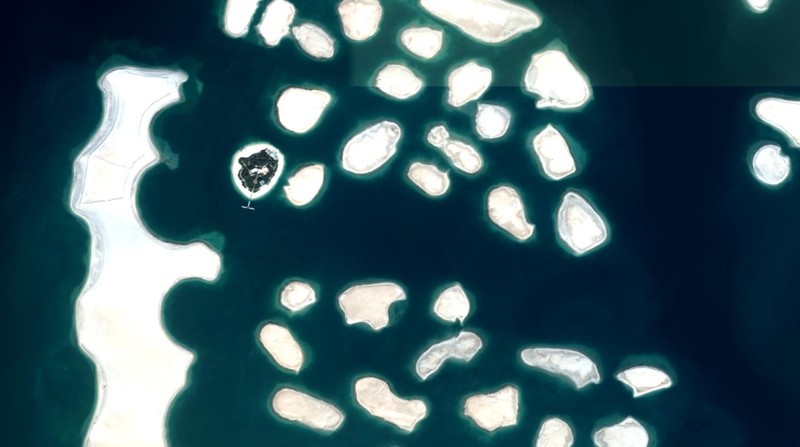 In addition to being underdeveloped, the islands appear to be sinking into the ocean. At least one person seems to have made an investment in a private island in the North America section. There are no roads connecting this to the mainland. 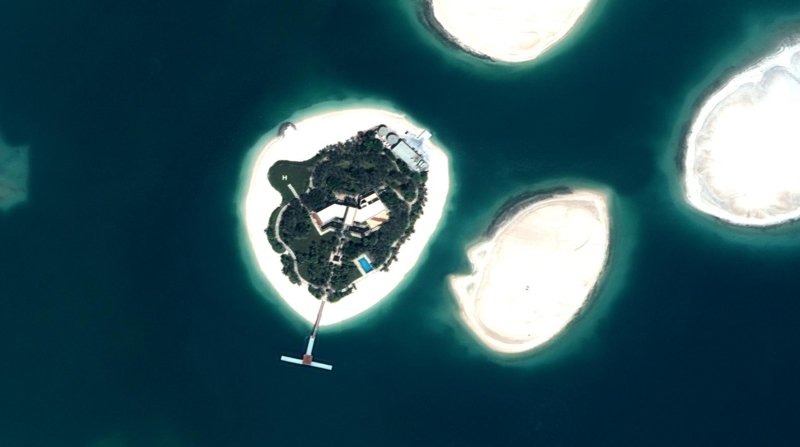 The only way on or off this island is by boat or helicopter (note the helipad on the western part of the island). I guess if you like privacy, then this is worth it. 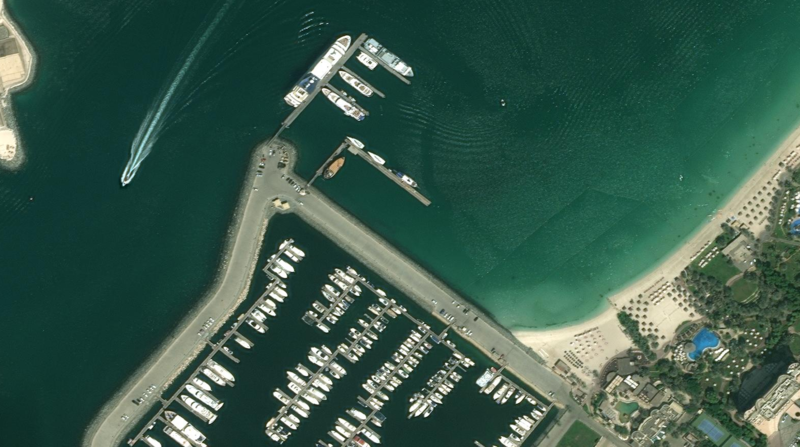 The Palm Jumeirah appears to be faring much better. 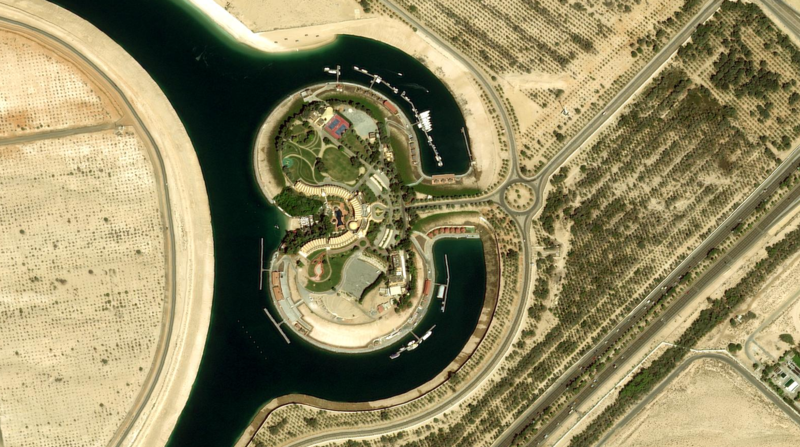 This is one of two palm-shaped island formations (the other being the Palm Jebel Ali). A third one was planned, but has not been developed. A detailed look at the spine of the Palm. It’s mostly developed, although you can see one of the fronds is still empty. The most expensive houses are on the tips of the fronds. This one, on the eastern half, is particularly impressive. 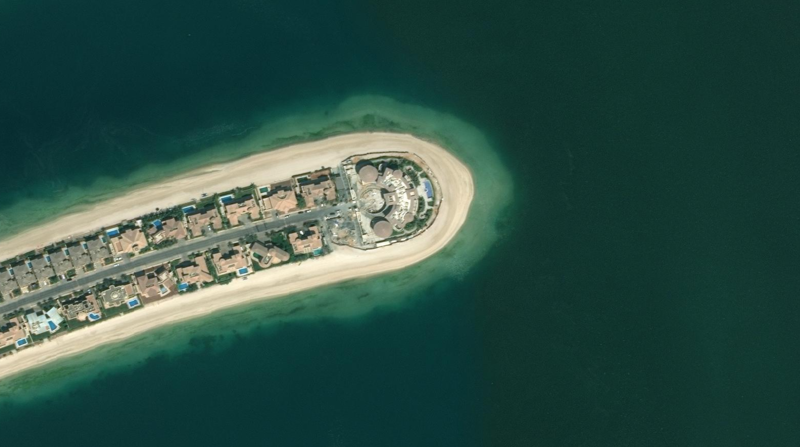 While the outer ring of islands is made up of hotels, the inner fronds are private residences. 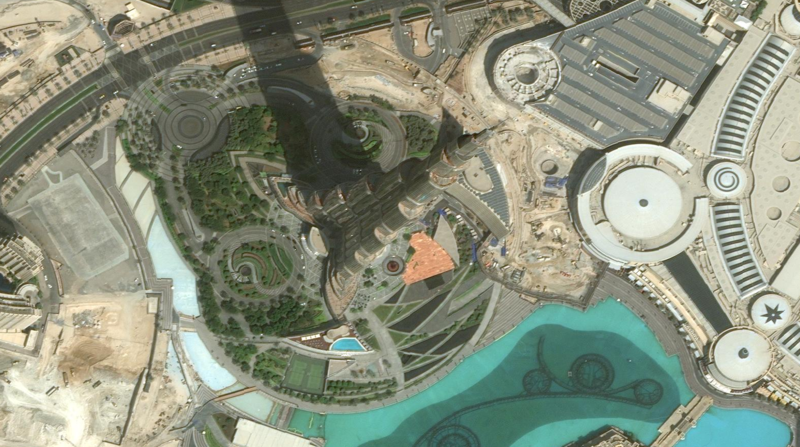 A more detailed look at the Burj Khalifa, the tallest man-made structure in the world. I honestly don’t know what this is; some kind of racetrack perhaps. It has smaller concentric tracks within it. Some agriculture imagery. As you can image, there’s not a lot of this in the desert. 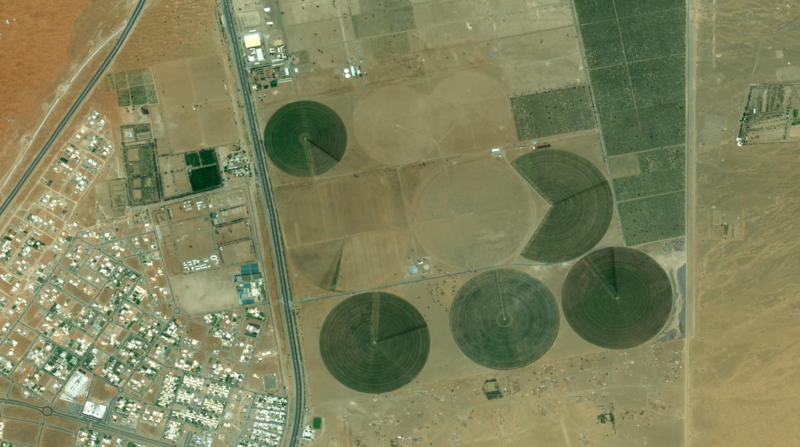 Center pivot irrigation, the style of farming here, makes for those circles which are fun to look at. 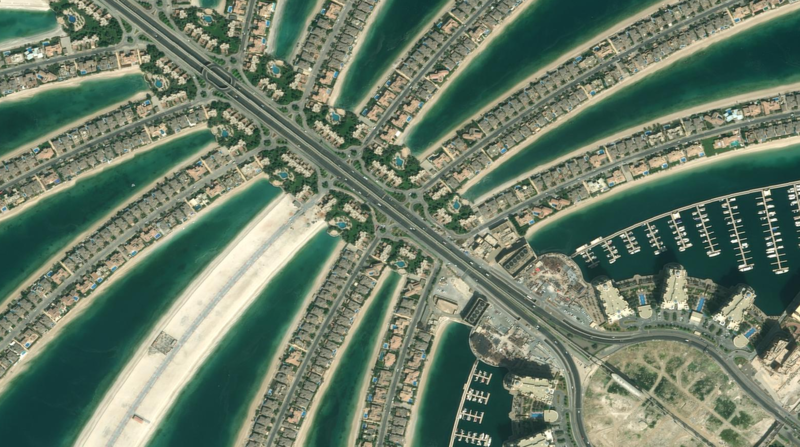 A very wide image of a highway outside of Dubai. I like this because it shows they very carefully planted trees around the edges of the highway. 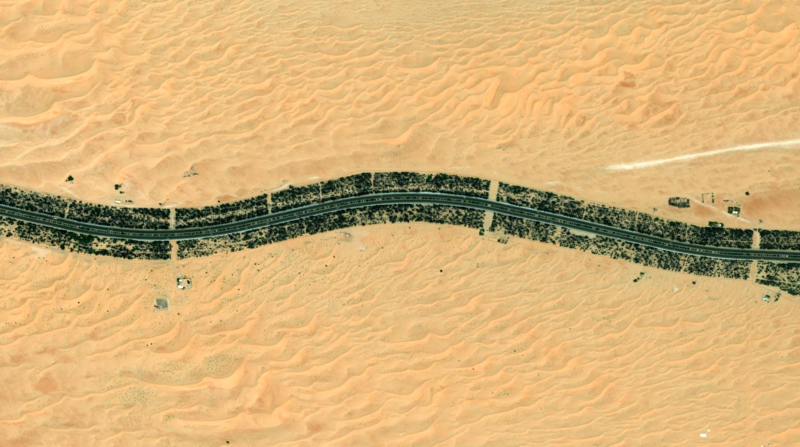 It’s probably to keep sand from blowing on the road, but I’m guessing it also creates an illusion that you’re not actually driving through the desert. 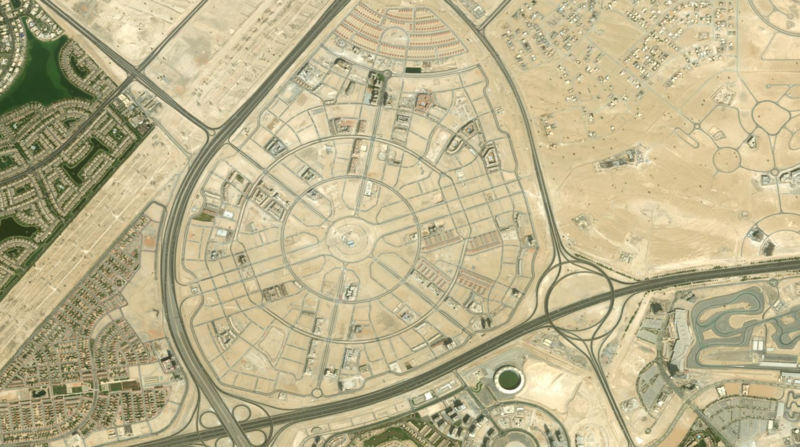 When planning neighborhoods and infrastructure, these UAE engineers really like geometric patterns, particularly concentric circles. 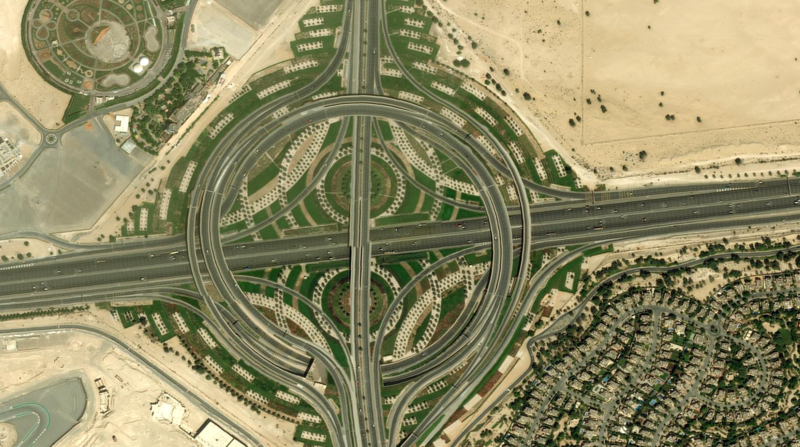 More ornate geometric patterns, this time in the form of a highway interchange. I don’t know what this is. 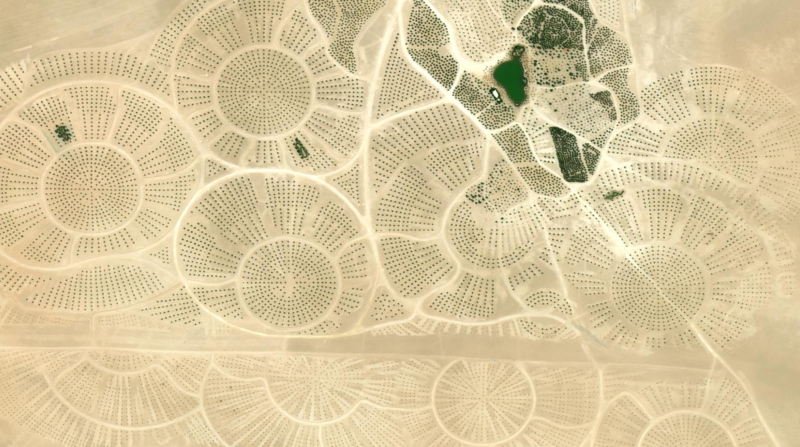 It appears to be some circular roads with some well placed trees extending outwards, but I can’t tell if this is supposed to be a neighborhood development. I think the engineers are just messing with me at this point. This looks like some kind of resort hotel. These are some very big yachts. They don’t appear very large until you compare them to the size of the cars parked nearby. I would occasionally find these compounds that are fenced off. I didn’t look up what they were. There was a lot of other stuff in the data set. I might return to it and try to find some more crazy stuff. If you’re into this kind of thing, then you should consider learning about geographic information systems (GIS).